Fax and Email intelligently linked to your accounting system. Ideal for sending newsletters, sale flyers, product announcements, brochures, price lists, holiday closing notifications, and more. DocuFire supports both fax and email output making it easy to get the message out. No messy importing or exporting, DocuFire links directly to your accounting system contacts, fax numbers and email addresses in real-time. Faxing and Emailing Invoices and Statements facilitates your Accounts Receivable collections effort. DocuFire cuts DSO (Days Sales Outstanding) by 4-5 days vs. postal methods and gets your documents to the right place fast. Say goodbye to postage, envelopes, paper, toner, labor and all the associated waste. Say goodbye to the boardroom envelope stuffing sessions. Say goodbye to standing at the fax machines or manual address selection. DocuFire is fully automatic and you will never re-key an address ever again. 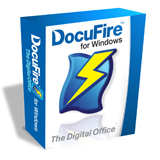 DocuFire integrates with the following accounting software. If you need more information or if you have any questions, please contact us. To read more about DocuFire, click here. Ceravolo Consulting serves Miami and South Florida areas for Docufire, Info-Alert, Accu-Dart and AccountMate and everywhere for development and website design.